Role playing is a learning structure that allows students to immediately apply content as they are put in the role of a decision maker who must make a decision regarding a policy, resource allocation, or some other outcome. This technique is an excellent tool for engaging students and allowing them to interact with their peers as they try to complete the task assigned to them in their specific role. This work can be done in cooperative groups and/or students can maintain the persona of their role throughout the class period. Students are more engaged as they try to respond to the material from the perspective of their character. Students immediately apply content in a relevant, real world context. Students take on a decision making persona that might let them diverge from the confines of their normal self-imposed limitations or boundaries. Students can transcend and think beyond the confines of the classroom setting. Students see the relevance of the content for handling real world situations. 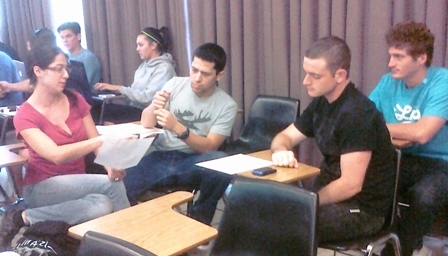 The instructor and students receive immediate feedback with regard to student understanding of the content. Students engage in higher order thinking and learn content in a deeper way. Instructors can create useful scenarios when setting the parameters of the role play when real scenarios or contexts might not be readily available. Typically students claim to remember their role in these scenarios and the ensuing discussion long after the semester ends. Offer a relevent scenario to students. This scenario should include the role the student must play, the informational details relevant for decision making in this role, and a task to complete based on the information. This information might be provided on the screen through power point or by using a handout. It is highly recommended that the instructions be provided in writing so it is clear to students what they must do and how? Give students five to ten minutes to complete the task. The instructor might have students do this alone or in small groups or follow the think-pair-share format in which students work individual and then discuss their results with their partner. Find a way to process student deliberations. The instructor might ask students to write their replies to submit or this might be a very good lead in to a larger class discussion where students can justify their differing outcomes or opposing views. One of the biggest challenges of the role playing technique is to get all students to participate and be truly engaged. Instructors might want to consider ways of increasing the likelihood of strong student participation. The instructor might offer a participation grade somehow tied to a short product students produce from their perspective in their given role. It is a good idea to find ways to increase student awareness of the likelihood their group might being called upon to share their answer with the entire class if they are playing their roles in a group context. The instructor might also consider using some of the role playing tasks in questions on exams and make it clear to students that that is the case. The instructor could even tell them that they might have to answer a question from the perspective of any of the roles, not just the one they were assigned. For example, in economics we teach that changes in revenue generated by a change in the price of a product are related the the price elasticity of demand for this product. Students are asked to imagine that they are members of a high school soccer team booster club. To make more money for the team, one parent has recommended an increase in ticket prices at the gate for games as a way to make more money. Another parent has suggested that the boosters would make more money if they actually cut ticket prices. While placed in the role of booster club member and parents of soccer players, students are asked to vote for either raising prices at games or lowering admission prices. After each student votes they are asked to convince their neighbor to vote the same way they voted. After a few minutes another vote is taken and then a fuller discussion takes place as students are asked to explain why they voted the way they did. The resulting discussion is usually a comprehensive list of reasons why attendance at high school soccer matches might be price-elastic or price-inelastic even though students might not yet be using those exact terms. See modules on Role-Playing Exercises and Context-Rich Problems (as many context-rich problems are structured as students taking on a role of some sort).